Without a public hearing, and without any research that this measure would actually save water, California’s State Parks agency is using the drought as an excuse to shut down a vital public water service that was used by 15 million park visitors last year. Incredibly, this ill-conceived, anti-public service move will not even save the relatively small amount of water that the State Parks agency claims it could. That’s because cold beach showers use, on average, just 1.2 gallon, whereas now that people are required to go home to rinse off, they’ll use an average of 17 gallons for a hot home shower. If just half of those impacted by the closing go home or to hotels to shower, then the beach shower shutdowns will waste an additional 100 million gallons of California water annually. Even if the shutdown did not consume far more water than it purportedly saves, it was still entirely unnecessary to remove a public water service that has improved hygiene and served beach visitors for generations. Before the implementation of the statewide beach shower shutdown, the State Parks agency, mostly through better conservation, had already met Governor Brown’s demand for a 25% reduction of water usage for every state agency. Assuming that the move actually saved the 18 million gallons that the Parks agency stated it “potentially” might, this amounts to just 4% of the total 446 million gallons now consumed at all 280 State Parks each year. And so, the battle over who will shoulder the burden of the worst drought in California history has leeched from politics into public parks. What’s more, the beach shower shutdown may well be the trial water balloon that initiates a flood of deceptive measures by government agencies eager to use water shortages as an excuse to drain important public services. 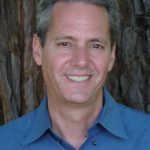 For this reason, the Sonoma Independent just launched a statewide petition (accessible on the right side of this page or by clicking here) to demand the restoration of public beach showers in California. Most Californians agree that we need to allocate water resources more wisely. Especially for agribusiness, which consumes 80% of all water used in the state. The state’s almond export crop by itself uses about 35,000 times more water than the beach shower shutdown purportedly saves. Nothing could be more contrary to the public interest than using the drought as an excuse to reduce public water services to the public, like beach showers, campground wash stations, restrooms, and water fountains. These public services provide enormous benefits while using relatively minuscule quantities of water. Earlier in the year, flush restrooms with sinks were replaced by waterless porto-potties with sanitizing liquid at Hearst Castle, visited by 600,000 tourists each year. California Parks, for the first time in generations, claims it has insufficient water to provide them with flush toilets and working sinks. How did water services in public parks become the fist major casualty of California’s drought? The sad, inconvenient truth is that we, the people feel powerless to do anything about the continued erosion of the public services that our taxes supported for decades. California closed dozens of state parks in 2011 after the recession. But despite a prospering economy and a huge state budget surplus last year, a number of parks never reopened, including my family’s favorite: Pomo Canyon environmental campground, nestled in the Coastal Redwoods. I call this a diminished expectation for responsive government. Despite our funding of ever more expensive salaries and benefits for our “public servants,” our collective powerlessness causes us to receive whatever carefully constructed propaganda is offered, and then walk quietly into the night of the new normal. A new normal of reduced public services for parks, hospitals, libraries, public showers, flush restrooms, sinks and even drinking fountains. Although government spending continues to hit new records, the reduction of public services are everywhere. As reported here at the Independent in recent months, Sonoma County’s public library system, which serves more than 100,000 of our youngest, oldest and neediest citizens was kept open 70 hours per week in 1980. Today, in a County which just recorded an unprecedented budget surplus, every member of the Board of Supervisors maintains that they have no power to do anything to address a funding crisis that has slashed library opening hours to just 40 hours per week, with Monday closings for the first time in a century. New cutbacks around Sonoma County include showers at Gerstle Cove in Salt Point State Park, and at Van Damme State Park in Mendocino County. The Parks agency had already turned off water to outdoor sinks (used by campers for drinking and dish washing) at Bodega Dunes Campground in Sonoma County and at MacKerricher and Russian Gulch in Mendocino. “Park officials say they can no longer justify the water use given California’s crippling drought,” the the Press Democrat recently reported. About one day’s watering of state highways. California’s State Highway agency uses 11 times more water than all 280 state parks. Two months of watering of a single golf course. California has 900 golf courses. Less than six weeks watering of a single almond farm. California has 6,500 almond farms and exports more than 75% of the almonds produced. Is This A Trial Water Balloon for Cutting Back Public Services? Closing beach showers may be a trial water balloon to use the drought as a deceptive excuse to further cut important public services. A Park’s official recently noted that the agency would not rule out further water cutbacks for sinks, bathrooms and pay toilets in state campgrounds and parks. State Parks is also considering closing some parks altogether due to the drought. This would not be surprising, since Lisa Mangat, the recently-appointed Director of the most magnificent and widely used state park systems in the world, came from the state’s Finance department and has no experience in public parks or public services. It’s not too late to change this misguided policy and restore public showers to state beaches. 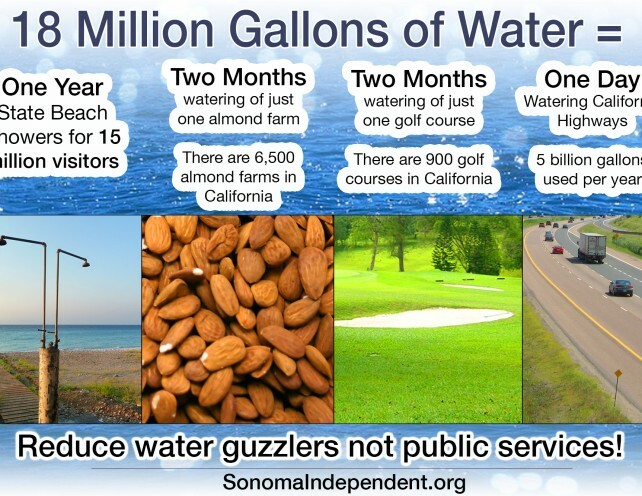 Signing the Sonoma Independent’s petition will let our elected representatives know that in this drought, we want to reduce water guzzlers—not public services.